Tina Halfmann has been the campus librarian for more than ten years at the only library in Minnesota where quiet is not allowed. She was in a new wave/punk band in college, toured with a band from Canada and helped promote bands at dingy clubs around Madison, Wisconsin in the ‘90s. Using her love of art and music to combat hate and fear, you can find her latest cause on the windows of the IPR Library. Tina received her Bachelor’s in Art from the University of Wisconsin, Madison; and her Master’s in Library and Information Science from The College of St. Catherine in St. Paul, MN. You can follow the latest events at the IPR Library on Instagram and Twitter (IPR_Library). As an old new wave/punk-rocker, I’ve never given two wads of spit about The Boss, but after reading his autobiography, Born to Run, I found his story so engaging that I found myself searching YouTube for Steel Mill, Springsteen’s first band. 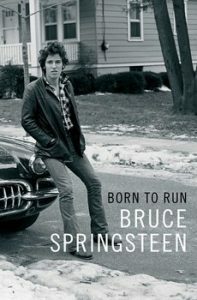 In the end, I’d have to say that Springsteen’s book, Born to Run is one of the best autobiographies that this librarian has ever read (and I’ve read many). Last night, I read about his first tour in California and the narrative is still with me today – the grit, humor, beauty, and soul. The narrative conjures up my own tales and misadventures while on the road with Furnace Face back in 1989. When I hear students in the library debate on whether or not to go on tour, I am so tempted to give them a reading list of musicians and bands who hit the road and lived to write about their experiences: the beauty and pain of self-discovery and, hell, seeing anything outside of their rut. This book would be at the top of that list. I’ve always thought of Springsteen as a guy’s guy. You know, a rough and tough, trailer hauling, Jack D-swigging, “take no prisoners” bro who tossed feelings into the bonfire and manned up behind the wheel of his pick-up. Wrong. Bruce writes about the dysfunction of his troubled childhood, and how, unbeknownst to him at the time, it emerged in his music. His book is more than just the musings of an aged rocker, though. I mean, he does his “What ifs…” and “What I didn’t know thens…” but, like a true rocker, he doesn’t ruminate; he just gives his reflections a “well, that’s that and it happened: onward.” He then dusts off his hands and moves on to the next memory. Bruce started with nothing but a love of music, mediocre guitar skills, and determination to make it big. If you asked him, it was that third factor that was the most important. He had times of self-doubt, but did not react to them. Instead, he’d compare his sitch to other acts, have heart-to-heart talks with close friends who would give constructive criticism, and make really tough decisions about his band – all while sleeping on floors, playing second hand instruments and eating beans n’ franks. He chose terrific musicians, but if they didn’t jibe with other folks, he gave them the boot. Would you want to spend three months stuffed in a van with a jerk? Bruce was honing his craft as manager right from the start and had the ability to make decisions about what was right not just for him, but for the band. He surrounded himself with multi-talented people who could toss more than just their musicianship into the soup. For instance, his manager could take apart an engine and put it back together, AND book gigs in California. It was a no-brainer to keep him on board. Before he had an agent, Bruce was the one booking gigs. How’d he do all of that without the Internet, cell phones, and social media? He’d investigate. Even though he was a teetotaler, he’d hang out in bars and clubs and talk to people. If the owner happened to be sitting there, he’d chat him up. It wouldn’t hurt to tip the waitresses to get some info or he’d simply work the crowd, all to get a feel for what they wanted in a band, and to see if his guys would fit in. He’d also reach out to big time radio stations, fib some minor details to help promote his band, and then show up, no matter what, and play. He had the fire and was ready for anything and learned from whatever came as a surprise. I realize things are different today as far as communicating and booking shows, but the basics still exist: focus, fortitude, and wisdom to know that suffering without having a decent meal is good for you. That sleeping on floors makes you stronger and playing to an empty house aren’t reasons to turn around and head home. Yes, our rocker heroes are getting older. They may be grizzled and grey, but they have lived unique lives on the road, on stage and in that arena playing to thousands. Remember, you don’t have to like their music to gain a little insight from their experience.